This cute little box is an idea I came up with one morning. At the time, I didn't know that I would turn it into a box. 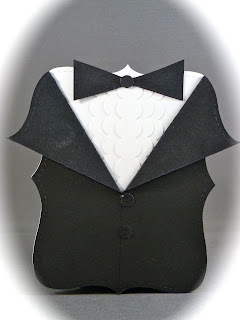 But, after seeing other Big Shot box ideas I decided to try it with the tuxedo. The base is made from a Whisper White piece of card stock cut using the Top Note Die from Stampin' Up! A second Top Note Die is cut from Basic Black and cut from the top center down about 1/3 of the way. Fold these out for the lapels using a bone folder. The "buttons" are 2 circles punched with a 1/4" circle punch. To make the shirt "ruffles" use Whisper White card stock and the scallop edge punch. Make 4 edges and 1 piece that you scallop along both sides. The bow-tie is free-hand cut from Basic Black card stock. In order to make this into a box, cut Basic Black card stock using the Bag w/Scallop Die for the Big Shot. Cut off the scallop part of the box, and adhere the rest together using Sticky Strip. Cut out one more Top Note Die from Basic Black card stock for the back and adhere to the box back. Then, adhere the shirt front to the front of the box using more Sticky Strip. Voila! A cute table favor for prom, wedding, etc.